Having passed the age of sixty, I have been told that I now have the right to indulge in reminiscence without apologizing. Thus, those of you of our piano customers who venture into this section of the site will have to tolerate my attitude if you please, and I hope that I can reward you in some small way with interesting stories of my past experiences. It sure beats having a "mid-life crisis." 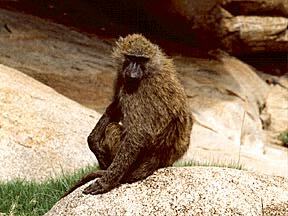 The baboon in the picture looks very much like the ones who stole my mangos as I was growing up. Hopefully, I have acquired a few more civilizing traits than this fellow, but I think he is very much in context on this page. Old African friends in Tanzania, like Frank Marwa, will certainly sympathize with anyone who had to deal with baboons. They are almost as troublesome as the IRS. I shall try to keep a healthy skepticism regarding my worth, since Christ Jesus is due all credit for anything I may contribute to life. I shall not, however; make silly scenes of false humility. My life has been rather colorful at times, not because of my own cleverness, but because my Lord has graciously chosen for me a life trail which is rather fun to look back over. I shall try not to dwell at length on the negative, but I shall use it at times to draw morals and parallels to biblical truth. You know, I have thought of this for many years. I thought of gathering my experiences, along with those of my past friends', and writing a fiction of a missionary's kid as historical fiction. Forget it. Life is too busy to figure out the details. So, what follows is partly mine, partly yours, and partly someone else's. "Don't look back when things are getting rough-- Look back when it is good now. The past will add peace to the moment at hand." FETCHING THE MAIL-- Online browsers may load this one. PAUL BEVERLY takes me on a bicycle ride. HAM BY MAIL Or, The Ham that crawled in From the Cold. STEVE'S WEIRD TALES "COMING SOON"
You can see what is coming by the unfinished list below. WILHELM MAY KEEPS IT IN "ECONOMY GEAR"
"THE HOOVER KIDS ARE NORMAL"
OMAR KHAYAM, VILLA VERDE, ADDIS ABABA RESTAURANT, CHUNG HUA, ITALIAN IN ASMARA, DEBRE BIRHAN, NAKURU TRUCK STOP, STAGS HEAD, LUNDIANI, NORFOLK, NEW STANLEY, FAIRVIEW, LINCOLN, U.S. EMBASSY, CEDARS OF LEBANON IN DEARBORN, BLUE NILE IN DETROIT, PALM IN BARSTOW, HILLTOP IN BAILEY, LION'S HOUSE IN LONDON, YE OLDE KING'S HEAD INN- WINDSOR, INTERNATIONAL HOUSE OF PANCAKES IN LA MIRADA, HUNAN IN LOS ANGELES CHINA TOWN, MA GANSIE'S IN KENTUCKY. "AND THE LORD GOD PLANTED A GARDEN..."
Great Place to Eat Ethiopian food.